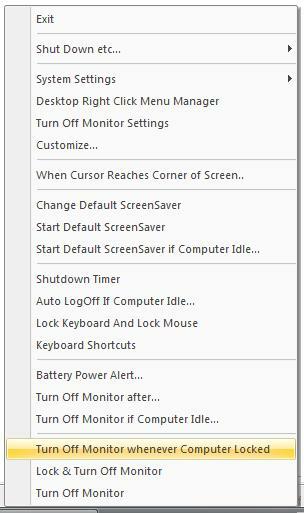 Download Trial Version of Turn Off Monitor Utility. Install and Launch the Utility. From System Tray Menu Select [Turn Off Monitor If Computer Idle...]. Enter the number of Minutes in the Dialog Box and Click on OK.
Now if there is no user activity (i.e. No Keyboard or Mouse Movement) on the Computer, the utility will turn off display. The Display can be restored my moving mouse a little or pressing a key on keyboard. On Windows XP a Windows Service can be configured to turn display off after x minutes of inactivity. The Windows Service can be helpful to control turning off display even when no user is logged in. The Windows Service mentioned above is not available for Windows Vista. In case you feel that the above said feature would have been implemented in a better way , please do write to us at support@rtsoftwares.com. Register Now (using PayPal Acount or Credit / Debit Card (without PayPal Account)): $5.00 and Turn Off Display manually or instantly, after configurable idle minutes and much more.